For the October 5, 2017, event, NASA’s SOFIA aircraft was based at the Daytona airport, where Embry Riddle Aeronautical University is located, and it made its first Atlantic flights, a test flight on Tuesday and the data-gathering flight on Thursday (Oct 5), the latter lasting about 8 hours. They went out about halfway to Europe, and then went a bit south by a few hundred kilometers as the latest astrometric predictions came in from colleagues, led by Amanda Bosh of MIT, working with the Discovery Channel Telescope in Flagstaff, AZ. Michael Person of MIT was the scientist in charge of the observations with the HIPO (High Speed Imaging Photometer for Occultations) instrument, mounted so it could see through the 2.5-m aperture of SOFIA’s telescope. (HIPO is being retired, in spite of its successes with this occultation and with two Pluto occultations.) Jay Pasachoff was in charge of ground-based support with the 1-m telescope of ERAU in Daytona, where he was working with Williams College undergraduate Christian Lockwood and our alumnus and present Yale graduate student Allen Davis. We were assisted there by observatory director Ted von Hippel. Williams College undergraduate student Ross Yu headed our successful observations with our Portable Occultation, Eclipse, and Transit System (POETS) with our 24-inch telescope at Williams College, Williamstown, MA. We had a second POETS at Embry-Riddle. The other four POETSs that Williams College and MIT purchased with a NASA grant a dozen years ago were deployed in the Canary Islands and in Europe, where other observatories also observed the occultation. 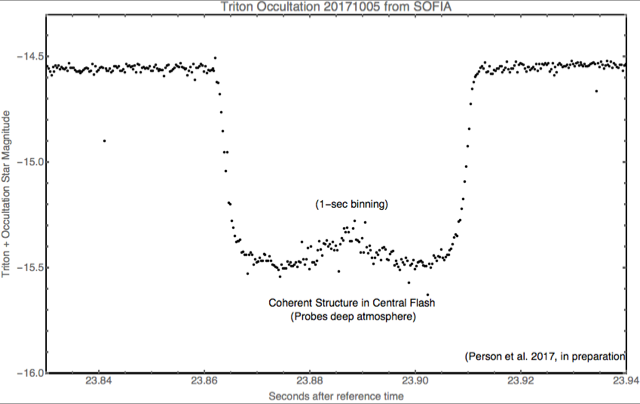 We have a successful light curve from SOFIA, with a central flash, which brightening in the middle of the two minutes of occultation allows sampling of Triton’s atmosphere closer to its surface than is otherwise possible. 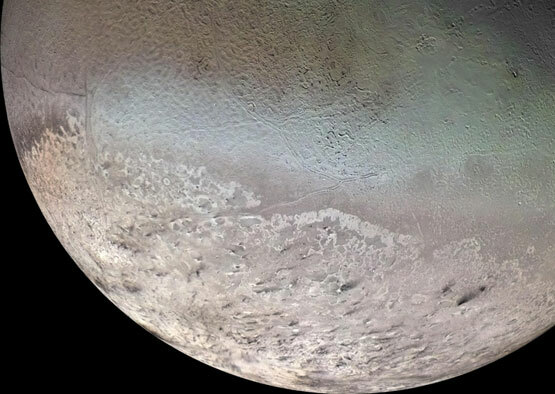 We have a light curve from the 24” at Williams College, which helps constrain the shape of Triton’s atmosphere, since it is around the curve of its shape. It was too cloudy to observe with the 1-m at ERAU, though we had had enough clear sky to observe a star to focus the night before. Stephen Levine of Lowell Observatory and MIT was successful with a light curve from the Canary Islands using the Jacobus Kapteyn Telescope of the Isaac Newton Group.